Have you ever eaten something for the first time and immediately wondered how you could have gone through life without ever having eaten it before? That is exactly how I feel about lobster rolls. I had one for the first time during the week of the U.S. Open, when the cafeteria at my job decided to serve it for lunch. It was delicious. The roll was toasted and the filling looks like it was made with chopped up lobster, mayonnaise, chives, and other seasonings. I was quite disappointed that this was only on the menu for this one day. 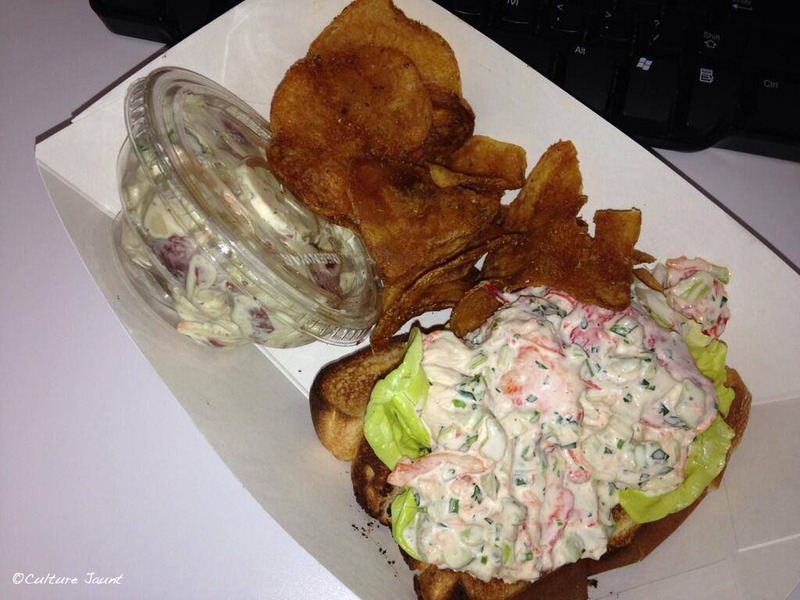 Lobster roll, seasoned chips, and potato salad. So last week, I very excited when our cafeteria brought in guest chefs Ben Conniff and Luke Holden of Luke’s Lobster in Philadelphia to make their version of the lobster roll. They are known for making their lobster rolls Maine style, and the owner Luke Holden grew up lobstering in Maine. I loved being able to see their process of putting together the rolls. First the rolls were coated with butter on both sides using a special machine – it was like a rolling glue stick of butter (obviously, I have no clue what the machine is called) – and then toasted on a portable grill. Next came the filling: whole lobster chunks, covered in lemon butter and their special seasoning. The lobster filling was placed on the roll and served. It was absolutely delicious. Topping the lobster roll with butter. Lobster roll, sea salt & vinegar chips, and blueberry soda. I enjoyed being able to taste one dish served two different ways, but definitely enjoyed the Luke’s Lobster version better because it had more lobster that wasn’t smothered in a mayonnaise sauce. 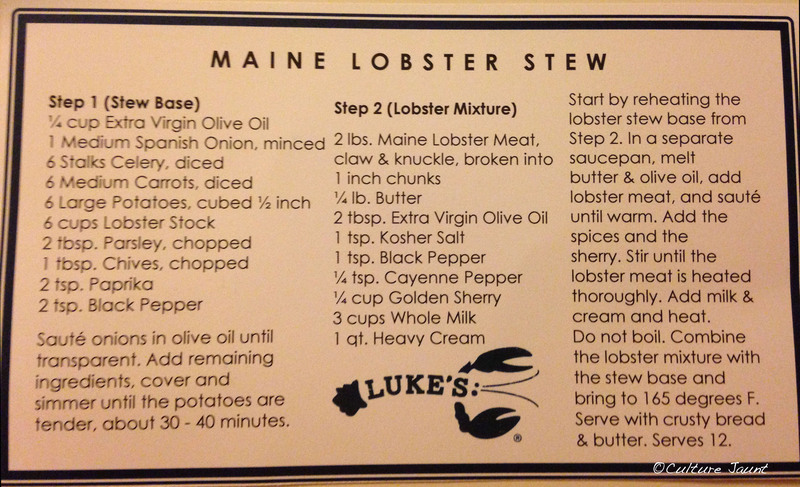 What was also cool, is that they had recipe cards available for Maine Lobster Stew. This is a dish I haven’t tried yet, but it has been added to my recipes-to-try list. What are some new dishes you’ve tried recently and absolutely loved? That lobster stew looks wonderful. A great meal for a cold winter night. You’re right. It would be a great meal for a cold night.